Something to take everyone’s mind off of all the cold weather! I guess all the snow outside is making people nostalgic for songs like this one, because I’ve received lots of requests to review it. Well, here you go, completely out of season! “Hot Summer” is a cover of Monrose’s song of the same name, except with an entirely different meaning of the word “hot.” It’s f(x)’s follow-up track to their “Danger,” which I enjoyed much more, but in terms of what I liked about the songs, they’re basically opposites. I liked the chorus of “Danger” more than the verses, but in “Hot Summer” I really like the verses but hate the main chorus. The verses are nice and sound kind of edgy, and I like the end of the chorus. 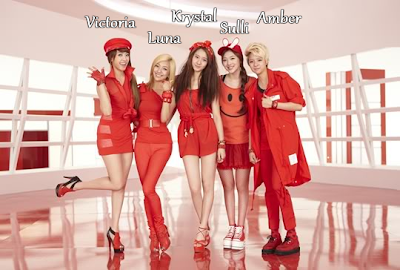 Victoria, Luna, Krystal, Sulli, and Amber. I like the very end of the chorus (“hot, hot, hot, hot summer”). That part sounds really cool. The chorus that comes before it, not so much (in my opinion). AMBERRR, I LOVE YOU. PLEASE MARRY ME. I am dead serious. I love Amber. I love her tomboy concept; I love her personality; I love her awesome fluency in English. I love that SM didn’t force her to wear high heels and dresses, that she can have her hair as short as she wants, and that it’s now her thing in each of f(x)’s new music videos. She basically refutes all stereotypes about Kpop girls just by existing, and though I like the other girls in the group, she’s really what makes f(x) such a special and unusual group to me. Also, this line is in Korean, but I just died laughing: “Let’s show the sweaty foreigners where to go.” It’s funny because it’s true. When I (attempt to) do these dances, I sweat so much more than the idols seem to. Victoria, Amber, Krystal, Sulli, and Luna. Oh my God, what is going on in this video? I mean, I appreciate that at least they’re not in the sterile white/geometric box for much of the video. However, basically nothing in this reminds me of a “hot summer.” The girls are “outside” in one of the three sets—good. But they’re outside…on a random street corner of a soundstage city with random set pieces that make no sense in the context of the song. You know what SM music video I liked that reminded me of a hot summer? Super Junior’s “Dancing Out.” In that one, the boys travel to Malaysia, wander around what is clearly a real city, dance together as real cars pass by, and end it all by jumping in a pool. That’s more what I wanted to see f(x) doing, enjoying themselves outside. Like New.F.O in “Bounce,” f(x) are an invading army from outer space. Luna is modeling the aliens’ natural look here. Their intentions are malicious: they want to take over Earth with their evil alien weapons from space, like their strange pink tank. Amber is clearly their bloodthirsty general, with the bullets hanging from her hat and her army gear. Except they are undone by a simple thing about the Earth’s atmosphere: it’s damn hot. Instead of unleashing the carnage they had intended upon the unsuspecting human race, the f(x) aliens are desperate to cool off and are willing to try anything, including doing a very silly dance indeed. The foolish humans join them in their dance, and f(x) mind-controls them into setting off a fire hydrant. Soon they will cool down and continue to wreak their vengeance! Biding their time before the vengeance-wreaking. What. Too far-fetched? YOU EXPLAIN THAT WHAT THAT TANK IS DOING THERE, THEN. Everything makes sense, like wiping their sweaty brows because it’s hot (except they’re not actually sweating), but the leg thing is weird. Distinctive, I guess, but definitely not cool. They look like there’s something wrong with them. Good, but again, what they’re wearing is generally inappropriate for the song. Most of the time they’re wearing at least three layers of stuff or jackets, Amber wears a beanie at one point, Victoria is wearing a leather dress, Luna and Krystal start wearing metal-studded things I would suggest are more appropriate for a biker convention than the beach…these fabrics do not breathe, costume designers! If it were actually a hot summer, f(x) would be having heatstroke in these get-ups. The tank Amber clearly stood out the most when she was focused on, but I don’t think she got that much screentime in comparison to Krystal or Victoria, so I have to give it to Krystal. If only that pesky repetitive chorus would go away, I very much like the rest of the song. Man, I can’t believe Krystal is SNSD’s Jessica’s little sister. That family’s got great genes, huh? If I had to guess, though, I would have said that Krystal and SNSD’s Yoona look like sisters. Someone else is spreading the Amber love~! She's my favorite member of f(x), honestly, and right now the only reason I pay attention to them....sadly. I didn't really like the song when it came out, and I'm still very "meh" about it. Part of the reason is because Amber doesn't get much time in the song (what, four lines? even boy group rappers get more than that! ), and the rest is just because...yeah, not my thing. The beginning of the chorus is okay to me, but the rest of it....eh. It just makes me think SM is losing their touch, because f(x)'s songs just seem to be random, and not have "their" sound, if you know what I mean? I really like the f(x) members. I LOVE Amber's concept, I really like Luna's personality (I think I'd name her as my current favorite), I think Victoria and Sulli are really gorgeous and elegant, and Krystal always stands out in music videos. There's nobody I don't like. And their songs are pretty good, too! It just makes me think SM is losing their touch, because f(x)'s songs just seem to be random, and not have "their" sound, if you know what I mean? I do know what you mean. It's hard to have the f(x) sound when they're just re-doing other people's songs--both this and "Danger" are just re-makes. It's frustrating because f(x) deserves their own songs (ones that feature Amber more prominently!!). I'm not sure if the problem is that SM's videos are just getting so boring or that it's the songs that aren't tailor-made for the groups. With all SM's money, they can afford to hire some composers, surely, instead of just buying the rights to perform other songs that aren't even Kpop! I liked the song for the exact opposite reasons as you, I loved the part leading up to the main chorus. And I liked the chorus quite a bit too. Its the rest of the song that got on my nerves... seemed off to me for some reason(I'm not counting the English rap part). My favorite part was the "I feel it in the air" bit at the end. Even if the rest of the song sucked(it didn't just trying to make a point here), that bit would have made my day anyway. Cool, thanks for letting me know. Different parts of this song seem to hit people differently, lol. The Korean word for sunglasses is 선글라스, which is pronounced "sun-gul-la-su" For the "ripping out my eardrums" section of your reviews, you should understand that the Korean pronunciation of words influenced by English may be different, and they are intended to be that way. Notice that Krystal (a California native) pronounces it 선글라스. OMG ! I love AMBER TOO !